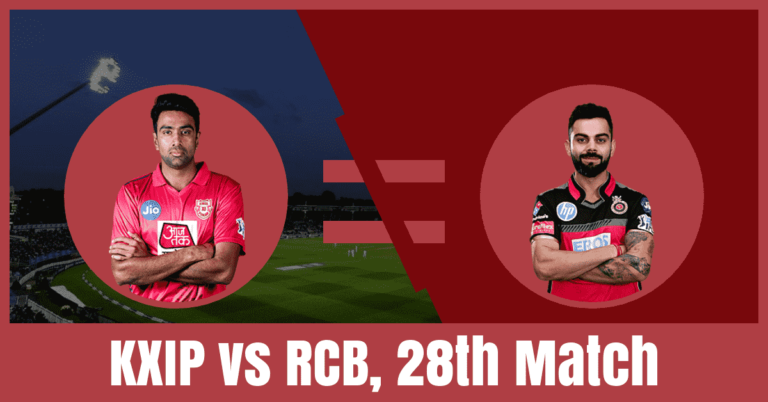 Who Will Win The Match Today of KXIP vs RCB 28th Match Indian Premier League 2019? Can Royal Challengers Bangalore register their first win against Kings XI Punjab? Kings XI Punjab is all set to take on Royal Challengers Bangalore on Saturday, April 13, 2019, at Punjab Cricket Association IS Bindra Stadium, Mohali. Read the complete post to find out who will win today. In today’s Royal Challengers Bangalore (RCB) vs Kings XI Punjab (KXIP) Dream11 Prediction we have covered predicted playing 11 of RCB vs KXIP, pitch report of Punjab Cricket Association IS Bindra Stadium, Mohali, weather report of Mohali, the best choice of captain and vice-captain, players recent and past performance, players injury updates. If we are looking for Bangalore vs Punjab full squad, KXIP vs RCB latest news, who will win today, toss prediction, astrology prediction, Dream 11 free grand league team then you are at the right place. 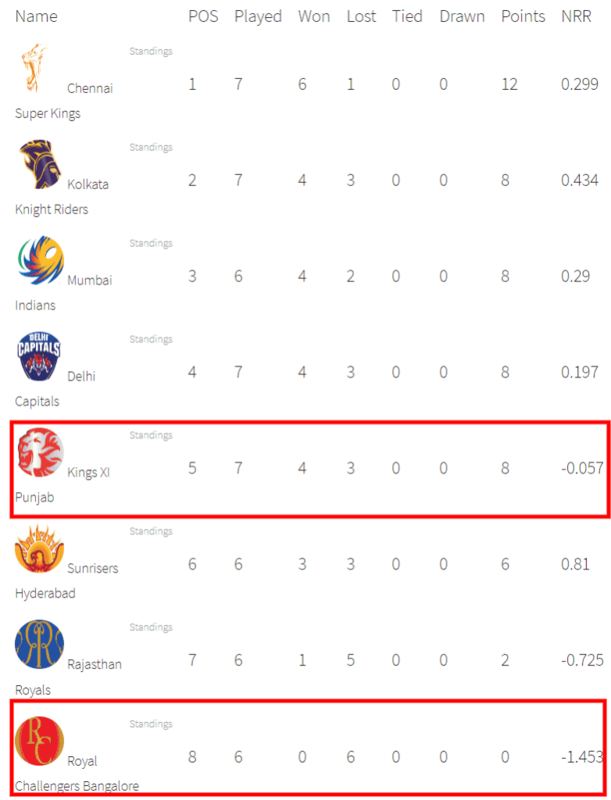 Kings XI Punjab is in the fifth position of the points table with eight points in their pocket. They have played 7 matches, won 4 and 3 matches. They have lost their last match against MI by three wickets. Prior to that, they have won against SRH by six wickets and lost against CSK by six runs. Lokesh Rahul, Chris Gayle, Mayank Agarwal, Sarfaraz Khan and David Miller are the top scorers of Punjab team. They have scored 317, 223, 184, 165 and 131 runs. Mohammed Shami, Ravichandran Ashwin and Sam Curran are the top wicket-takers. They have taken 9, 8 and 7 wickets. On the other hand, Royal Challengers Bangalore have disappointed their fans. They are in the last position of the points table. They have failed to win a single game in the 12th season of Indian Premier League. They have lost their last match against DC by four wickets. Prior to that, they have lost against KKR by five wickets and lost against RR by seven wickets. Virat Kohli, AB de Villiers and Parthiv Patel are the top scorers of Royal Challengers. They have scored 203, 173 and 172 runs. Yuzvendra Chahal and Navdeep Saini are the top wicket-taker. They have taken 9 and 2 wickets. Chris Gayle had some fitness issue but the coach Mike Hesson has confirmed that his playing chance is very high. If Mayank Agarwal is fit to play then he will replace Karun Nair in the playing XI. Ankit Rajpoot is injured so he will not play. Hardus Viljoen will replace him and Murugan Ashwin will replace Mujeeb Ur Rahman. Ravichandran Ashwin and Sam Curran will play as a key all-rounder. M Ashwin and Mohammed Shami will lead the bowling department. Lokesh Rahul and Chris Gayle are the most valuable players of Kings XI team. Batsmen: David Miller, Chris Gayle, Sarfaraz Khan, Mayank Agarwal, Mandeep Singh. All-Rounders: Sam Curran, Ravichandran Ashwin. Bowlers: Mohammed Shami, Hardus Viljoen, Murugan Ashwin. Ravichandran Ashwin(c), Lokesh Rahul(w), Andrew Tye, Chris Gayle, Moises Henriques, David Miller, Simran Singh, Karun Nair, Mujeeb Ur Rahman, Mandeep Singh, Arshdeep Singh, Sarfaraz Khan, Varun Chakravarthy, Sam Curran, Ankit Rajpoot, Hardus Viljoen, Harpreet Brar, Mohammed Shami, Murugan Ashwin, Mayank Agarwal, Darshan Nalkande, Nicholas Pooran, Agnivesh Ayachi. Virat Kohli, AB de Villiers, Parthiv Patel, Yuzvendra Chahal and Navdeep Saini are the key players of Royal Challengers Bangalore team. Umesh Yadav will replace Mohammed Siraj in the playing 11. Dale Steyn has replaced Nathan Coulter-Nile in the squad and he will join the team by 15th April. Tim Southee, Navdeep Saini and Yuzvendra Chahal will lead the bowling department. Virat Kohli and AB de Villiers are the most valuable players of the Royal Challengers team. All-Rounders: Moeen Ali, Marcus Stoinis. Bowlers: Yuzvendra Chahal, Pawan Negi, Umesh Yadav, Tim Southee, Navdeep Saini. Virat Kohli(c), Prayas Barman, Parthiv Patel(w), Washington Sundar, AB de Villiers, Milind Kumar, Marcus Stoinis, Devdutt Padikkal, Moeen Ali, Himmat Singh, Akshdeep Nath, Shivam Dube, Pawan Negi, Gurkeerat Singh Mann, Tim Southee, Umesh Yadav, Mohammed Siraj, Shimron Hetmyer, Yuzvendra Chahal, Colin de Grandhomme, Navdeep Saini, Kulwant Khejroliya, Heinrich Klaasen. The pitch of Punjab Cricket Association IS Bindra Stadium, Mohali is good for batting especially in the second half of the match. The batsmen will have to spend some time on the wicket to score big. The bowlers may find it difficult to take advantage of the wicket. According to Crix11 astrology cricket match prediction, Royal Challengers Bangalore will win the match today. You may like to read CSA T20 Challenge Dream11 Prediction. Kings XI Punjab will win the toss and opt to field first.